Do you have a boy or girl who likes nothing more than kicking a ball around? 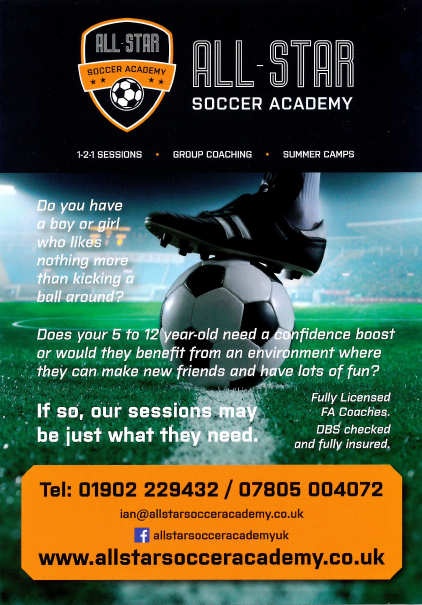 Does your 5 - 12 year old need a confidence boost or would they benefit from an environment where they can make new friends and have lots of fun? If so, our sessions may be just what they need. Sessions on Saturdays. Book now as spaces are limited and call for costs. 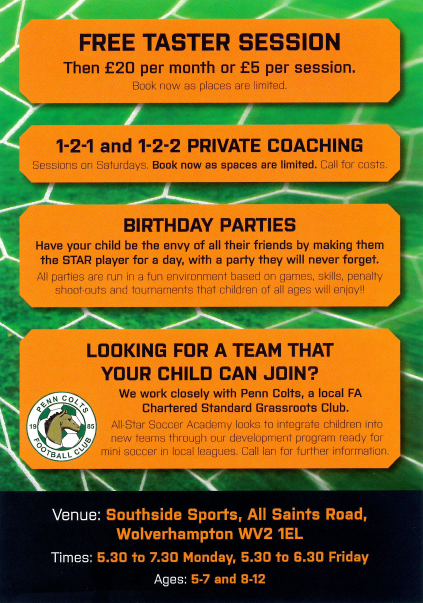 Have your child be the envy of all their friends by making them the STAR player for the day with a party they will never forget. All parties are run are run in a fun environment based on games, skills, penalty shoot-outs and tournaments that children of all ages will enjoy. LOOKING FOR A TEAM THAT YOUR CHILD CAN JOIN? We work closely with Penn Colts a local FA chartered standard grass roots club. All Star Soccar Academy looks to intergrate children into new team through our development programme ready for mini soccer in local leagues. Call Ian for further information and prices.